How to Download and Convert 2018 World Cup Most Impressed Highlights Videos? Now, 2018 World Cup is around the corner. Fans are looking forward to the magnificent opening ceremony and show their predictions on who will win 2018 FIFA World Cup and if there will be a new World Cup winner. Well, it's the right time to look back previous World Cup matches and pick out the most unforgettable highlights which left deep impression on us. Here, I will list the most splendid highlights of 19th FIFA World Cup and recommend an effecient way to download and convert 2018 World Cup highlights videos from YouTube or other sites with a powerful YouTube video downloader and converter for playback on portable devices, iPhone, iPad, Andriod smartphone/tablets smoothly. WinX YouTube Downloader - Free download World Cup highlight videos from 300+ sites. WinX HD Video Converter Deluxe - Download/convert World Cup video to iPhone, iPad, Android or other devices at will. Every World Cup we witness too many great moments, excited, moved or sad. Here I conclude the following highlights which are considered as the most memorable scenes of 19th FIFA World Cup. On June 16, 2010, 2:30 AM, the second match of G group: Brazil against North Korea was started. The moment national anthems of these two countries were played, the North Korean striker, Jong Tae Se was seemed to be very excited and wept. In the match, Jong Tae Se performed very strong and powerful. Even though North Korean lost the game because of the overmatched opponent, fans were completely shocked by their sportsmanship that they never gave up. As anticipated, Zidane didn't appear on the field so that French and fans put their hopes on Henry, the French team leader. But, 2010 World Cup is proved to be the most depressed World Cup for French. They even didn't get through group match for they just got 1 point. 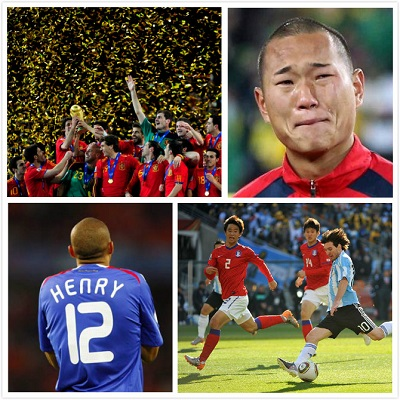 And Henry's sad back became the most unforgettable moments for fans. The third match of B group, Argentina vs. South Korea was played on June 17, 2010. In this match, Argentina defeated South Korea with a comprehensive victory: 4-1. Although Messi didn't score any goal, he showed us his brilliant skills while he passed by 6 South Korean players successively and reminded fans of Manadora in his heyday. In my mind, the most impressive highlight in World Cup 2010 is the Final, Spain vs. Netherland, both of whom had never won World Cup in history. Maybe they took this match too important so that they presented very carefully in the match time and entered into a deadlock. Time flied and the score kept 0-0 till match time was over. In the overtime, Spain midfielder Iniesta scored one goal to lead Spain to win 2010 World Cup and claimed their first World Cup title. Actually, you can get a large amount of World Cup videos from YouTube or other video-sharing sites. However, if you would like to play 2018 World Cup highlight videos on portable devices, such as iPhone, iPad, Samsung Galaxy S8, without any ads and buffering, you may need download and convert 2018 World Cup highlight videos. And, the powerful World Cup highlights videos downloader and converter: WinX HD Video Converter Deluxe, which is capable of free downloading 2018 FIFA World Cup highlight videos from 300+ sites and convert those videos to AVI, MOV, MP4 etc, for PC/Mac and mobiles, will be a good helper. Step 1: Hit YouTube URL. Copy URL of desired highlight video from supported sites and paste it to address bar of smaller downloader window. Click Analyze buttion on the right of address bar. Step 2: Video info incl. title, duration and results of resolution, sizes, formats and codecs will be presented to you. Please select one result and click OK to download. Notice: the "Auto convert" module is shown for you to check it to add the downloaded video to convert list or uncheck to just free donwload 2018 World Cup highlights videos online. Step 3: Output profiel dialogbox pops up the moment video is added to convet list. Take converting to iPhone as example. Access Apple Device from Ouput Profile Category and Click "to iPhone Video". Then, choose the appropriate format for your iPhone model, such as iPhone 5s/5c. Step 4: Set destination folder by hitting Browse button to save downloaded and converted 2018 World Cup highlights videos and click RUN button. 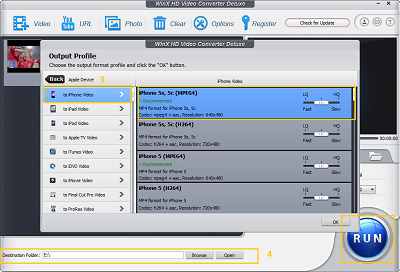 WinX HD Video Converter Deluxe also allows you to convert home-made videos, HD recored videos by camcorders in formats M2TS, MOD etc, to general video formats, such as AVI, MP4, MOV and so on and mobiles like iPhone, iPad, Android smartphone/tablets. Besides, it can create photo slide show videos with BGM and edit video by cropping, trimming, merging and adding subtitles. WinX HD Video Converter Deluxe - Download/convert any World cup music/videos, like World Cup theme song, opening/closing ceremony, highlights, greatest moments, game matches from YouTube, Vimeo, Dailymotion and other 300+ sites to Apple/Android/Windows devices with no effort at all. Shakira FIFA World Cup Songs Free Download in MP3 MP4 etc.